With increasing demands upon sewerage networks to attenuate and provide storage capacity for storm water flows, water companies are required to invest into new and existing storage systems. All such systems encourage the settlement of solids and sediments which can lead to operational problems and high maintenance costs. Incoming organic material also results in considerable odour nuisance. In order to effectively clean up the retention tanks, the VacFlush flushing system was developed which can be used with or without electrical energy. 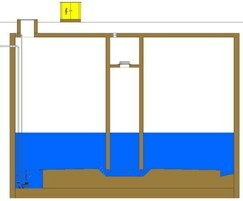 Once the water level in a tank or a sewer reaches a certain level, a vacuum pump switches on automatically and fills the flushing chamber up with water. 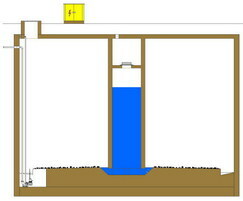 As soon as the basin or the sewer has been emptied, the sediments remain on the tank floor. Now the flushing process starts automatically by filling the tank or sewer with one surge using the water from the flushing chamber. This powerful flushing action means that any deposited sediments are carried away and the tank floor is clean again. 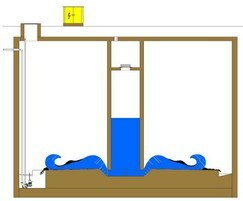 Incoming mixed water is used to fill the flushing chamber up using a vacuum pump. This starts even with a minimal filling of the tank, respectively with each partial filling event. 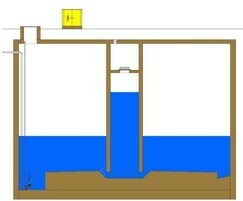 Once the tank or sewer is empty, the flushing sequence starts automatically. A powerful water surge rinses the floor clean, without any moving parts in the tank.